Bristol Rovers report that the Memorial Gates have been vandalised. The Memorial Gates and property outside were vandalised overnight on Wednesday 23rd December 2015. There is shock and disgust throughout Bristol that these Gates have been the targets of vandalism. It is hoped that the individuals concerned will quickly be identified and reported to the police. “BCFC are appalled to hear a minority of so-called City supporters have desecrated the Memorial Gates. We join BRFC and the wider Bristol sporting community in condemning this action. Anyone found guilty of carrying out this mindless act of vandalism will face a lifetime ban from Ashton Gate. 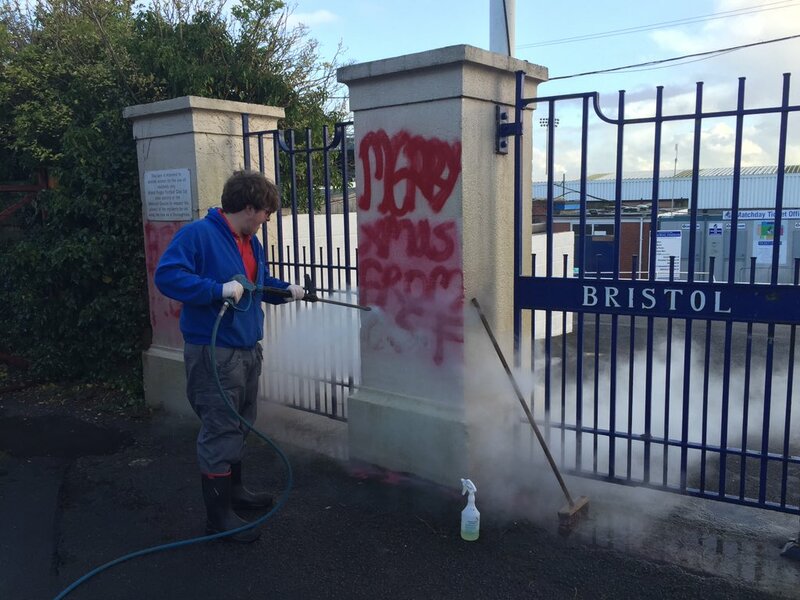 We are working with Bristol Rovers to ensure that the graffiti is removed as soon as possible. A member of The Lansdown Club, thejetwashingcompany, has agreed to remove the graffiti immediately.